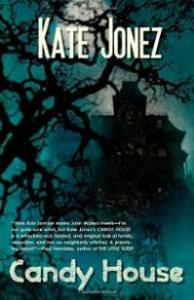 Kate Jonez writes dark fantasy fiction. Her debut novel Candy House published by Evil Jester Press is available at Amazon in print and ebook. Ceremony of Flies is forthcoming from Dark Fuse April 2014. 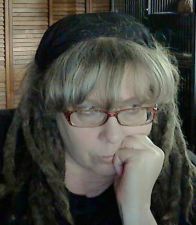 She is also chief editor at Omnium Gatherum, a small press dedicated to providing unique dark fantasy, weird fiction or literary horror in print, ebook and audio formats. Three Omnium Gatherum books have been nominated for Shirley Jackson Awards. DM: Thanks for taking the time to chat with us! Tell us a little more about your novel Candy House and your upcoming work Ceremony of Flies. Ceremony of Flies is a tale about a young woman with dreams of being a singer who is running from her past and a know-it-all good ole boy who is just trying to get to work on time. As they fly through the desert from Las Vegas to LA in a fine looking classic car named Linda, they find themselves inextricably linked when one uses the other’s gun without permission. When they rescue a stranded boy and his dog from a lonely crossroads in the Mojave desert they decide for the first time in their lives to do the right thing. Their one selfless act unleashes a terrifying onslaught of demonic trouble as they struggle to get the boy to safety. DM: What's it like working with Evil Jester Press? The folks at Evil Jester Press are a pleasure to work with. Their enthusiasm for their projects is inspiring. Eric Shapiro does an exceptionally fine job with editing. DM: You're a writer and an editor—which is more awesome? Or are they both? Writing and editing provide different sets of challenges. Both are satisfying and I'd have a hard time deciding which I like the best. Writing, in the early stages, is a solitary activity (which suits me). I love creating new worlds and filling them with characters. I love being the puppet master. I try not to let that spill over into my home life. Not that anyone would much listen to me if I handed them an outline anyway, but it's good not to be too bossy. Editing is also rewarding. I am proud that I've had a part in shaping the amazing books published by Omnium Gatherum. Working in a collaborative environment can be very stressful. Making a story as good as it can be without being heavy handed is a lot like performing brain surgery. One slip and the patient can end up a vegetable... okay maybe not. But editing a book is serious business. The work of an editor should be invisible. So I guess the conclusion here would be that when I'm writing I'm the Puppetmaster and when editing I'm the Shadow. DM: What's some advice you can give to writers just starting out? Don't do it. Learn how to play video games instead. You should practice playing video games every day for several years. If after that time you still want to write a book, type one up, then throw it away. Don't show it to anyone and please don't spread it around on the internet. Repeat and then do it one more time. The third one should be pretty good. You can send that to [email protected]dia.com. Also, read everything.